Chiropractors specialize in spine, joint, and nervous system health. We are, by dint of our training and studies, particularly well-suited to help heal back pain, and to do so naturally. The big reason chiropractic care is different is that we focus on the spine and nervous system, and we take the time to see how spine or joint issues could be affecting the body as a whole. We’ll start your consultation by talking about where you feel pain as well as your medical history. We may also take X-rays or do some other testing. The point is to help us get to the root of the issue so we can develop the appropriate care plan. Of course, we also don’t want you to have to suffer through pain while we do all this, so most chiropractors will take the time to offer initial pain relief during your consultation. Once we know what is going on with your body, we can develop a care plan that will help your body heal as well as relieve pain on an ongoing basis. A lot of back pain occurs because of either joints that are not properly aligned and/or tight muscles and supporting soft tissue. Many medical treatments rely on medication to mask symptoms, but don’t actually treat the injury itself. This often means injuries heal poorly and can cause ongoing pain, even for years after the initial injury. Chiropractic adjustments and other treatments work to help injuries heal properly. This often means getting joints back to proper alignment, which will reduce the strain on muscles, ligaments, and tendons around the area as well. With the joint in alignment and the strain on muscles reduced, your chiropractor can work with you to build muscle and improve range of motion to help minimize the chance that the injury or issue will come back again. Since chiropractic care uses natural means to treat back injuries, it can also be combined with other healing techniques. Things like massage therapy or physical therapy can supplement your chiropractic care to further promote proper healing and build strength. To be sure you’re getting the full benefit, however, be sure you discuss any other treatments with your chiropractor — and to mention your chiropractic treatments to any other medical professionals you work with. Every injury and body is different. 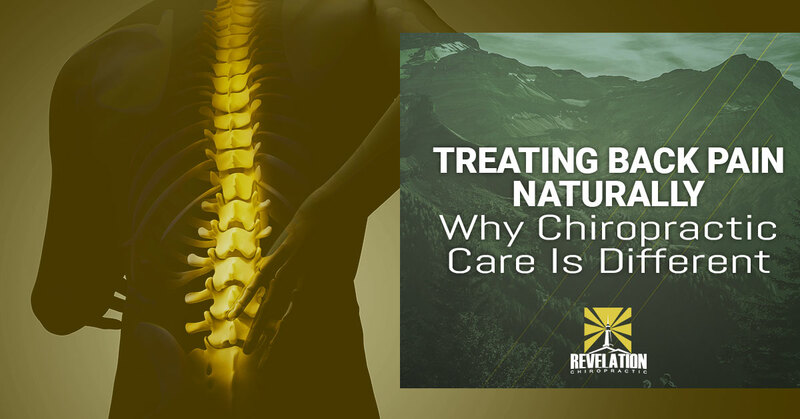 At Revelation Chiropractic in Fort Collins, we take the time to understand what is happening in your body, get down to the root cause of your injury, and create an individualized treatment plan based on your needs. If you experience back pain, numbness, tingling, or any other recurring pain, chiropractic care may be able to help provide you with lasting healing. Schedule your initial consultation and meet with our experienced and caring chiropractor to start on the road to recovery. Give us a call or connect with us online to learn more about how we can help you heal.